More than 40,000 health IT professionals, clinicians, executives and vendors from around the world are at the 2017 HIMSS Annual Conference & Exhibition in Orlando. The conference, which started Monday, February 20 and runs through Thursday, February 23, allows more than 1,200 leading health IT vendors to share how they’re changing the healthcare landscape. Jamf is excited to be a part of the discussion. Amid the sea of vendors that inhabit modest to elaborately designed booths is a variety of solutions. From hospital beds to iPad case manufacturers, and everything in between, vendors are sharing how they can make a positive impact within healthcare. And there are plenty of people to listen. Brian, who comes from a company that provides remote support and knowledge-based tutorials, isn’t an exhibitor. Instead, he traveled from Chicago because he knew HIMSS had exactly what he needed. “A lot of the vendors we use, along with our future partners, are here. And healthcare is our next big market,” Brian said. And like many of the attendees, he’s taking his time to navigate the conference. “I started on that end yesterday,” he said, pointing to the far end of the large conference hall, “And I’ve only made it this far.” Brian will use his final day at the conference to make it through the rest of the exhibits. “It’s a lot of walking,” he said with a smile. But it’s worth it. After a long but inspiring conference, HIMSS 2017 will end tomorrow afternoon. 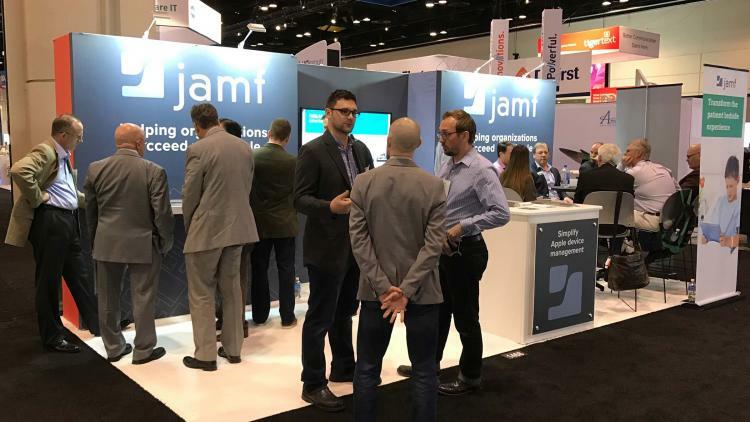 Jamf is proud to be a part of an event that’s at the forefront of enhancing healthcare. To those who joined us – thank you. If you couldn’t make it, visit www.jamf.com/healthcare to hear our story. We can’t wait to tell you how Jamf is helping provide better care, one iPad at a time.